Edition 22: Book Review: The Singular & Extraordinary Tale of Mirror & Goliath: From the Peculiar Adventures of John Lovehart, Esq. I’m always on the search for a unique speculative fiction experience that I can introduce SQ Mag readers to. This time round I discovered The Peculiar Adventures of John Loveheart, Esq. series by author Ishbelle Bee. Indeed, The Singular & Extraordinary Tale of Mirror & Goliath proved to be written in a different way to anything else I’ve read. While experimentation can be good, in this case, it didn’t always work in favor of the story. 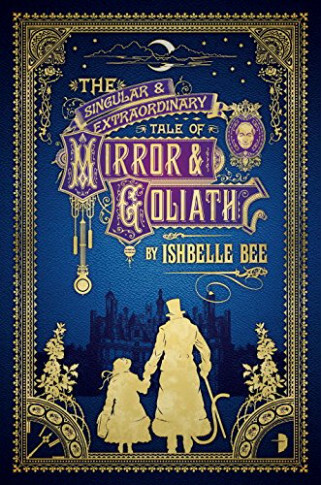 This tale, as the title suggests, centers around a young English girl by the name of Mirror and her guardian Goliath. Mirror had the unfortunate experience of being trapped in a grandfather clock by her insane grandfather and left to die. Goliath, who was a police officer at the time, found her surprisingly still alive. We soon discover that her miraculous survival is the result of ancient magic, which left Mirror possessed by an Egyptian spirit that endowed her with remarkable gifts. Goliath—a very large, half-Egyptian man—became Mirror’s guardian after that. His mission now is to protect her from the Lord of the Underworld and his minions, who have dubious intentions. Since rescuing Mirror, Goliath himself has become a shapeshifter, turning into a bear, lion, or another ferocious creature when necessary. As the story progresses, we are introduced to a supporting cast of very odd characters, most of whom have ties to the Underworld or are incredibly eccentric. All are connected to a sinister plot involving serial murder in the pursuit of immortality. As far as the main characters go, we get the sense that Mirror and Goliath love one another deeply, at first like father and daughter. Later their relationship seems to blossom into that of lovers, though only after an inexplicable scene where Mirror suddenly becomes an adult. John Loveheart, the other character mentioned in the title, is the adopted son of the Lord of the Underworld, and steadily becomes an ally to Mirror and Goliath. His colorful description, actions, and personality were more deeply developed than the other cast members, which made him my favorite character. While I’m not sure the word art added anything to the story itself, it was definitely interesting. Though interesting and unique is often a good thing, some of this experimentation hindered the flow of the book. Almost every passage read like a creative writing assignment with so much sensory language and internal dialogue, it didn’t leave room for much actual story. The language felt stilted with very few contractions and disjointed thoughts. Tense shifted from past to present several times within a chapter. Time shifted back and forth between chapters so much that I had a hard time keeping up with where I was in the storyline. The scenes with the best flow were those from the point of view of the police officers, which actually brought us into the story with straightforward prose and very little fluff. More of this would have kept me solidly engaged, and it’s only when those scenes came about and the plot threads began to come together near the end that it became a page-turner for me. Also—and this is a minor disappointment—from looking at the cover, I expected a steampunk element to the story, but there was none. All in all, Mirror & Goliath proved to be an interesting read, particularly if you’re looking for something different than the norm in the way it is written. It’s worth checking out if you like a paranormal element in Victorian era stories. Due to some graphic violence and language, I’d recommend it for young adults and beyond. Mysti Parker is a wife, mother, and shameless chocoholic. While her first love is romance, including the Tallenmere fantasy romance series and an award-winning historical with EsKape Press, she enjoys writing flash fiction (the weirder the better) and children’s stories. She resides in Buckner, KY with her husband, three children and too many pets. Posted on August 31, 2015, in Edition and tagged book review, edition 22, mysti parker, review. Bookmark the permalink. Leave a comment.